Electric car brand Tesla has unveiled what it describes as the safest sports utility vehicle (SUV) ever made, which includes a “bio-weapon defence mode”. Elon Musk – Tesla’s billionaire founder and serial entrepreneur – emphasised the Model X’s safety credentials, its practicality for everyday family use and the importance of creating sustainable electric cars for the environment during the launch yesterday. The California-based company’s first SUV builds on the intent to make electric cars practical for everyday use, while maintaining its position as a leading player in the automotive industry’s recent shift to electric technology. Traditional manufacturers are responding to Tesla’s innovations, with companies including Porsche, Aston Martin, Audi, Bentley and McLaren all recently launching models that use hybrid and electric technology. Tech giant Apple is also rumoured to be developing an electric vehicle with the ultimate aim of producing ever-more efficient battery technologies that could be used in other consumer products. Every part of the Model X was designed with safety as the first priority, according to Musk, who went on to describe it as “the safest SUV ever made”. “We’ve got to such a low probability of injury from a high-speed collision thanks to the design and fundamental architecture of the car,” he continued. 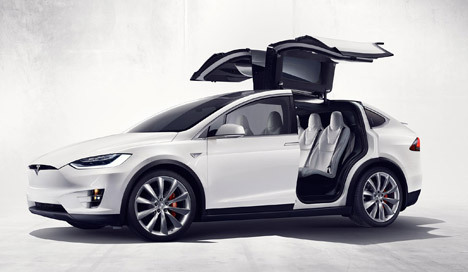 A floor-mounted battery forms the foundation of the Model X’s architecture, creating a low centre of gravity that reduces the likelihood of the vehicle being flipped over in an accident. By positioning a small electric motor down by the battery pack, the Model X has a larger “crumple zone” than most petrol-powered cars, where the engine block is housed at the front. The crumple zone is the section of a vehicle designed to crush easily in a crash and absorb the main force of an impact. 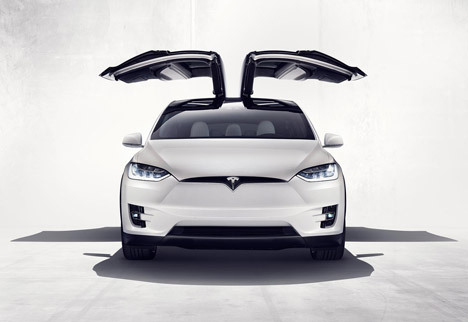 In addition to designing a structure that is safer than comparable SUVs available on the market, Tesla has also fitted the Model X with what it calls Active Safety features. Cameras and a radar system interpret the proximity and likeliness of collisions, and automatically engage the brakes when required. Ultra-sonic sensors are also fitted around the vehicle, which allow the car to automatically steer away from the perceived danger. Improved air filters have also been developed for the Model X to ensure the occupants aren’t breathing in pollution from smog-filled cities. The vehicle’s sensors also detect where approaching occupants are, and automatically open and close the doors “like an invisible chauffeur”. The rear falcon-wing doors are fixed on two hinges, allowing them to open up and out in tight spaces. If parked in a garage, ultra-sonic sensors calculate the roof height and side obstacles, and automatically calculate a new opening arc. 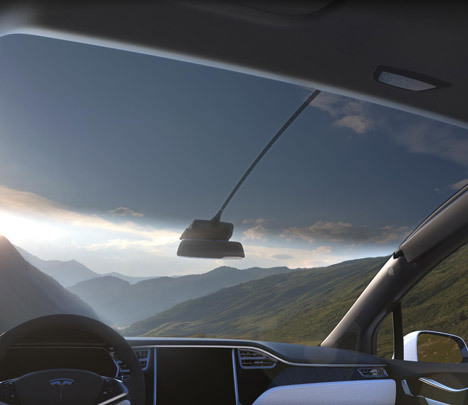 Inside, the windshield has been extended over the roof to provide better views and improve the driver’s awareness of other road users. Pared-back seats offer increased storage space and leg room. 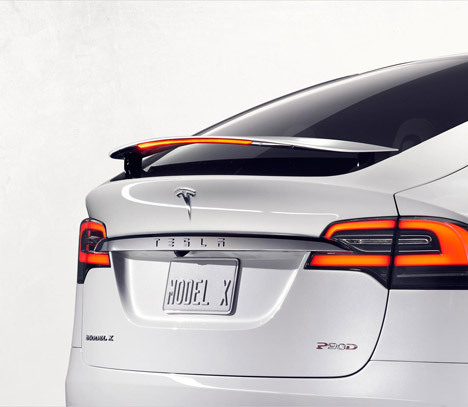 Model X is capable of a 257-mile range (413 kilometres) in standard mode, reaching speeds of 60 miles per hour (100 kilometres per hour) in 4.6 seconds. In “ludicrous” mode the range decreases to 250 miles (402 kilometres), but 60 miles per hour can be achieved in 3.2 seconds. Tesla’s other electric vehicles include the Model SD that can be “summoned” by owners to pick them up autonomously, and the Roadster 3.0 that can travel over 400 miles on a single charge. The company has also launched batteries designed to power homes and businesses in a bid to cut fossil fuel usage.